After finishing off the re-assembly of the guest bedroom yesterday morning (on top of an absolutely insane work week) I planned to go out to the shop and make some progress on the Thorsen Cabinet. And I did, right after a short power nap. I sat down to watch a few minutes of a Paul Sellers video on making a Craftsman-style lamp, and I just sort of folded up. Once I made it out to the shop I picked up where I left off. I had the top cut to size, flat and square – but I noticed that it had slightly bowed. as had the sub-top in the cabinet. 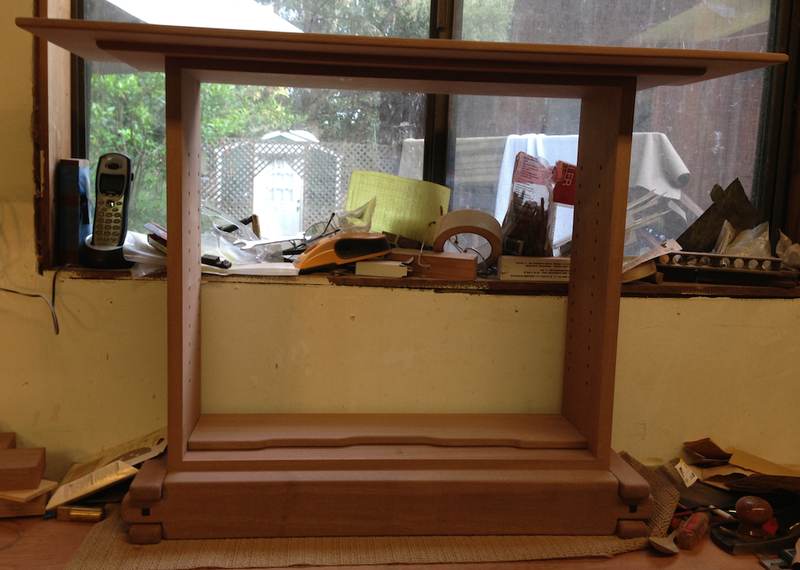 The main top panel was easy to re-flatten, I’m still dealing with the warp in the assembled cabinet. I put a clamp on it to pull it back straight and left it overnight, hopefully that will let me glue it up today. I should explain the construction on this cabinet a little. 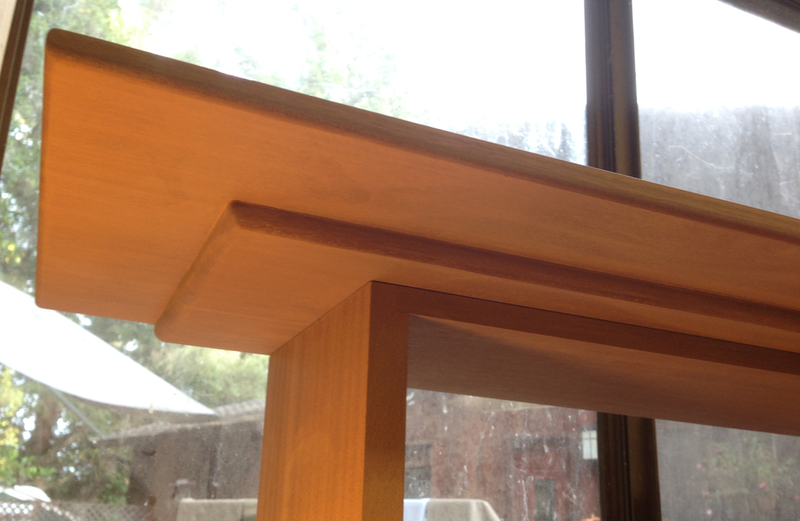 The sides of the cabinet are 3/4″ thick. 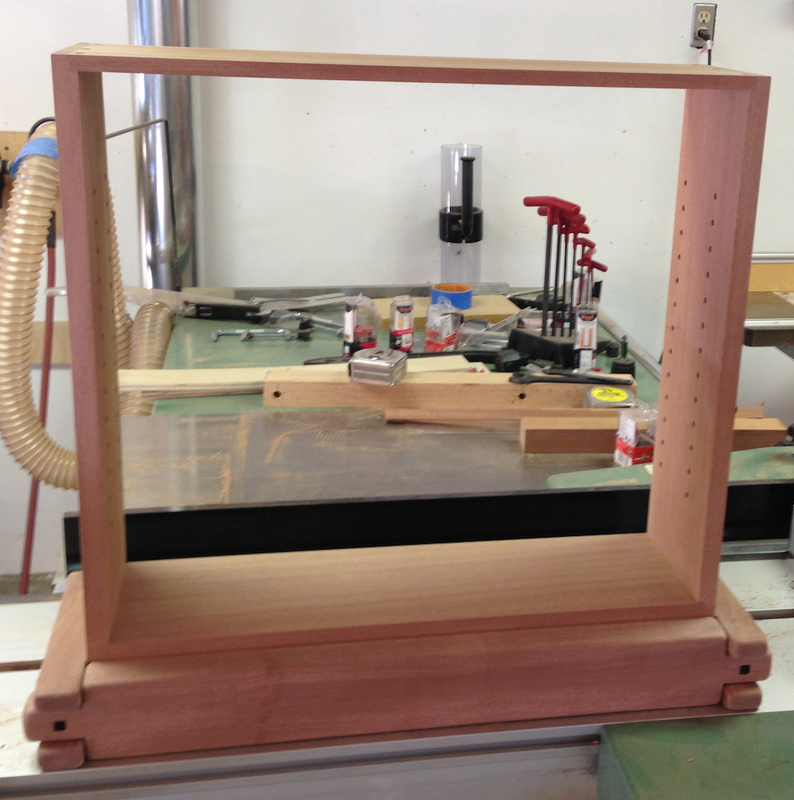 There is a 1/2″ thick top that is glued/screwed into a rabbet cut into the sides. 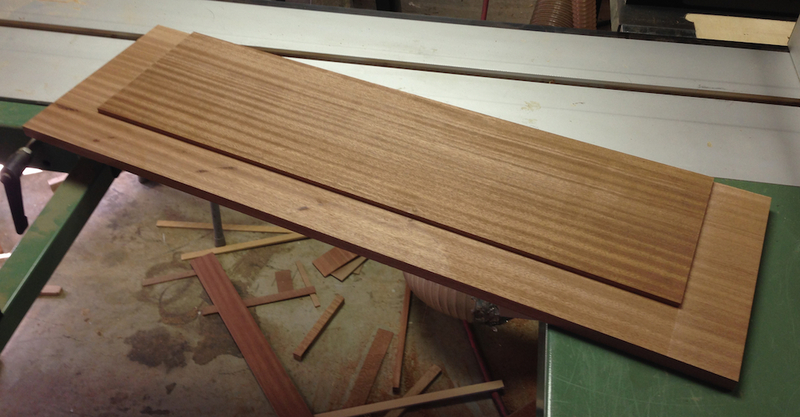 Then there is a 7/8″ thick top that is longer and wider than the cabinet that will be attached to the cabinet. In the video they showed driving six screws through the sub-top into the larger overhanging top, then plugging all six screw holes. I didn’t care for that approach, so I am planning on just gluing it — but no matter what the two surfaces need to be true to have a clean glue up. 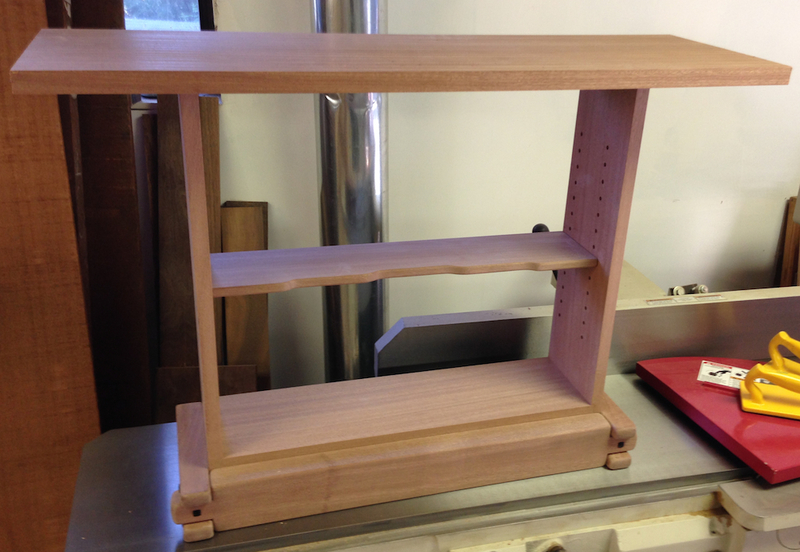 Here is the cabinet with the unshaped top sitting in place. The larger “over top” needs to be undercut along the bottom to produce a 5/16″ profile. I made a giant tall fence for my table saw out of MDF, cranked up the blade to 2.5″ and made three rip cuts to remove the 5/16″ waste. The first pass I undershot a little (shown below) and only removed about 1/4″. I re-set the fence (measure twice, cut twice) and remove the rest of the material. The resulting surface was not really acceptable, there were minor differences in height between the end cuts and the long rip cut at the front (maybe 1/32″). I used my low angle jack plane and a shoulder plane to clean up the surface, right up to the reveal. Then I used an 5/16″ ovolo bit to shape the reveal, and a 3/16″ round over bit to shape the edges. I perhaps could have done these steps with some hollow moulding planes, but I only have odds and ends, and I haven’t spent the time to get them all sorted out. Maybe I’ll block out a day this week to get the ones I have set up and figure out. Anyway, the router made quick work of the edger treatments, and I followed that up with a round of sanding to make everything nice. With the top sitting in place on the cabinet you can see the final effect. I did a dry run for the glue up, and decided I wanted to try to convince the sub-top to go back to being flat before I glued this. I put a clamp on it to pull it slightly past flat in the other direction and left it over night. I’ll get this glued up one way or another this morning. 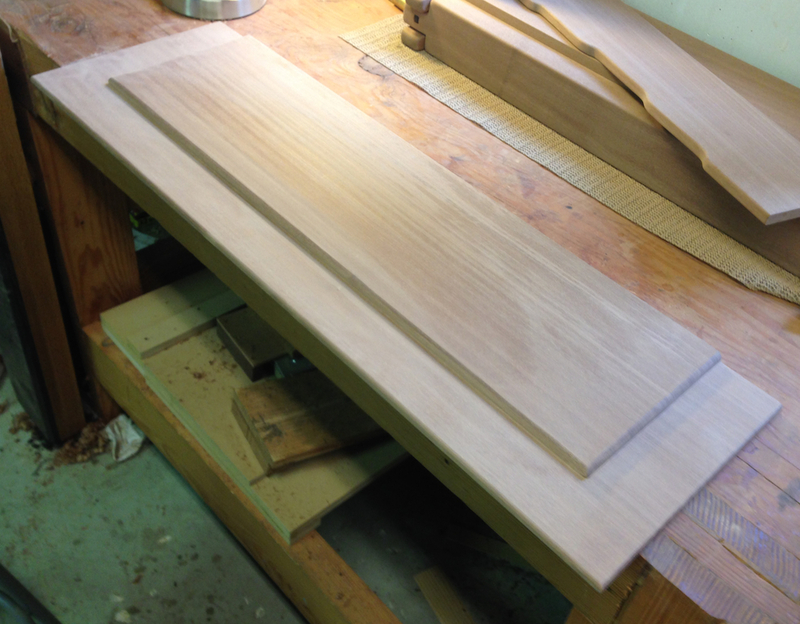 Then I have a little work to do for the cabinet back, and finally on to the door construction. One more view… I need to clean up the shop and put away tools before I start the next step. The shape of the over top is very nice. Keep up the good work!